In recent decades, scientists have noted a surge in Arctic plant growth as a symptom of climate change. But without observations showing exactly when and where vegetation has bloomed as the world's coldest areas warm, it's difficult to predict how vegetation will respond to future warming. Now, researchers at the U.S. Department of Energy's Lawrence Berkeley National Laboratory (Berkeley Lab) and UC Berkeley have developed a new approach that may paint a more accurate picture of Arctic vegetation and our climate's recent past – and future. The 30-year historic satellite data used in the study were collected by the National Oceanic and Atmospheric Administration's Advanced Very High Resolution Radiometer. The data was processed by Boston University, and is hosted on NEX – the NASA Earth Exchange data archive. Their data analysis revealed that 16 percent of Earth's vegetated land where plant growth was limited by cold temperatures three decades ago is no longer predominantly temperature-limited today, a result that was not reproduced by the CMIP5 models tested. "Our findings suggest that CMIP5's predictions may have significantly underestimated changes in the Arctic ecosystem, and climate models will need to be improved to better understand and predict the future of the Arctic," said first author Trevor Keenan, a faculty scientist in Berkeley Lab's Earth & Environmental Sciences Area and an assistant professor in UC Berkeley's department of Environmental Science, Policy, and Management. 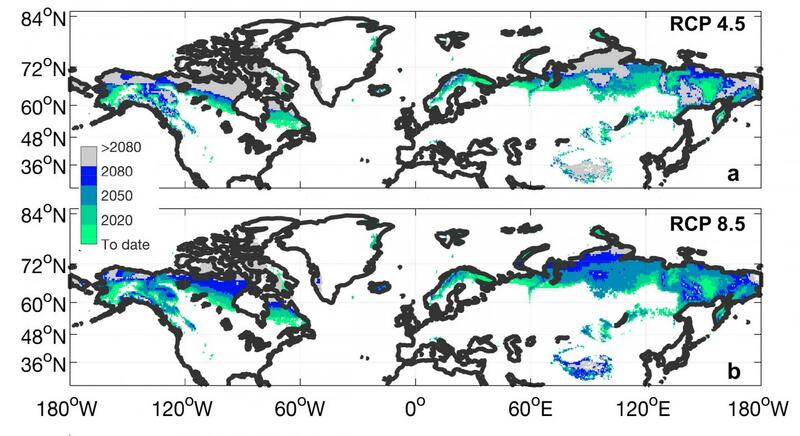 Keenan and Riley used the satellite data to build a new observational benchmark that quantifies the growing expanse of vegetated land in the northern hemisphere. They also estimated changes in the proportion of the Earth's surface where plant growth will no longer be limited by cold temperatures over the 21st century. Keenan and Riley project that by the year 2100, only 20 percent of vegetated land in the northern hemisphere will still be limited by cold conditions that have been in place there for centuries; the remaining 80 percent will no longer experience sufficiently cold temperatures, and with earlier springs, plants will grow sooner, in unexpected places and to an unexpected degree. Scientists collaborating through the World Climate Research Programme developed the CMIP5 models to help researchers around the world gain a better understanding of the relationship between carbon emissions and global warming, among other goals. International consortiums such as the IPCC (International Panel on Climate Change) have also used CMIP5 projections to inform policy decisions. Keenan said that while the CMIP5 models provided researchers with a broad overview of the problem, they do not always accurately represent the important roles plants play in reflecting light back into the atmosphere, sending water back into the atmosphere, and absorbing carbon dioxide. "No one has looked at high-latitude systems from this angle before as they are very complex, but they're important as they control multiple feedbacks to the Earth system," said co-author William Riley, a senior scientist in Berkeley Lab's Earth & Environmental Sciences Area. The study was funded by DOE's Office of Science. Additional funding was provided by the National Aeronautics and Space Administration.